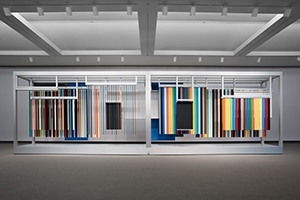 Jennifer Marman + Daniel Borins, Pavilion of the Blind, 2013. Mechanized vertical blinds, shades, and panel systems (custom colored), motors, micro controller. 10 x 32 x 4 feet. © Dan Dabrowski, 2013.